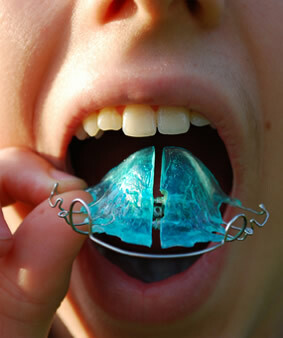 Removable orthodontic devices are retainer-like devices that move teeth. This is opposite to a standard retainer which is used to hold teeth in their new position. Removable devices often contain springs or screws and are used on their own to correct minor problems or help achieve a desired movement with full braces. It is not unusual for your teeth to feel sore in the areas where a spring is active. Any tenderness should disappear within two to four days after the device is activated. Soft foods and pain relievers, such as Advil or Tylenol, are the best way to deal with tender teeth. These devices are usually worn FULL TIME unless Dr. Steiman says otherwise. Always remove it for eating, sports, and cleaning. When a removable device is not in your mouth, please keep it safe in the retainer case that we give you. Extra fees are charged for lost or broken removable devices. Cleaning is easy with a toothbrush and toothpaste or soft soap. Like a regular retainer, removable devices can build up hard calculus or begin to smell if they are not cleaned properly. Talking will be a little funny at first when you get your removable device, but within a day, you will learn to speak with it just like normal. If you are having any problem with your removable device, such as broken acrylic, bent spring or wire, or the device is just not fitting properly, don't try to fix it yourself. Please call our office as soon as possible and we will bring you in quickly and repair it properly.